Worried about the impact of your stairlift on the rest of the household? Put your mind at ease, stairlifts are designed to be unobtrusive and as safe as possible. Homes with children, pets, and shared stairways are no problem and should not be a deterrent when making your buying decision. Visit a brick-and-mortar retailer to see for yourself. If you have been considering installing a stairlift, you may be wondering about the kind of impact that the new equipment will have on the rest of the household. 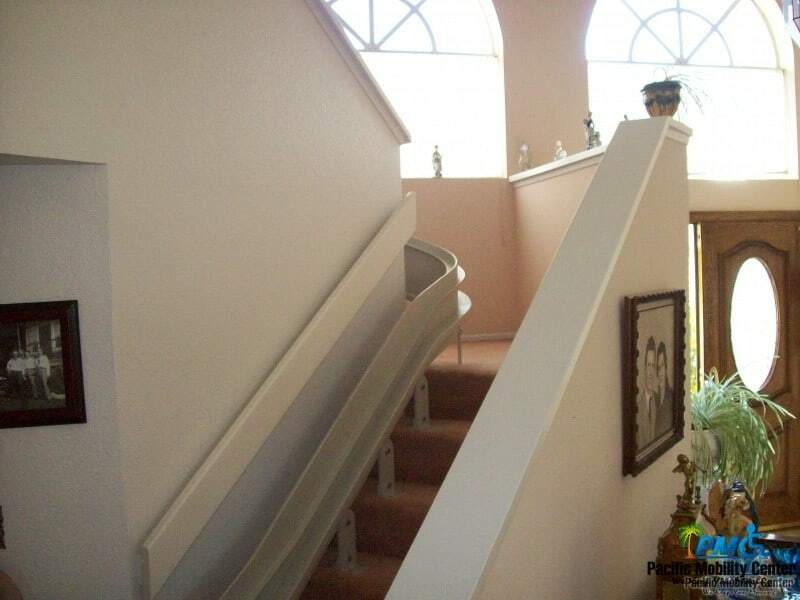 If you are worried that a stairlift could be risky in homes with children or pets, don’t. Talk further with the mobility experts at Pacific Mobility to see how a new lift will fit cohesively and inconspicuously into everyday life, as well as what safety features are offered. Will a stairlift restrict normal access? How can you make sure it doesn’t? Stairlifts are designed to be space-conservative when not in use, so they don’t cause a barrier or obstacle for those going up or down the stairs. Again, if you are concerned about space to access the stairs, the only tight spot might be a curve or corner. However, when the lift is not in use, you should be able to traverse the stairs normally. Stairlifts are very thoughtfully designed to be adaptable and convenient for the operator- and those living in the same home. The features and safety offered makes for a seamless transition after installation. Most family members living in homes with stairlifts report that they adapt to having it around quite quickly and that it is not much of an issue or hindrance in everyday living. Got kids in the home? How about children that visit the home routinely? Stairlifts are designed to be safe and have features to prevent anyone from getting hurt – including curious kids! Finger guards will keep small fingers from getting nipped and there is a mechanism that halts movement of the lift when an obstacle is present. Remember that your stairs are no more or less dangerous to children using the stairs, so they should be supervised as usual. The only potential issue is that the tracks used for the lift may prohibit the use of a baby gate, which may require other measures to keep young ones safe. The only real impact that a stairlift will have on your pets is the sound; while quite quiet, the sound of the lift may be frightening to your pets. This may cause them to basically avoid the lift when it is in use, which is a good thing. Beyond that, there are really no safety risks for pets, as the lift will cease moving if an obstacle, or pet, is in its path. Try a stairlift out before making your decision or ask for a demonstration. Visiting a retailer can put worries about how it will fit in your home environment as well as what it will look like. Know someone with a lift? Talk to them about how their family is impacted by the stairlift. This research may help make your choice more clear. Stairlifts are typically designed and installed with the convenience and safety of the entire residence in mind. If you have distinct concerns, voice them; your mobility retailer should be able to put your mind at ease and reassure you of the ease when transitioning to a stairlift in the home. Ready to increase access and convenience with a stairlift? Talk to the team at Pacific Mobility; they will address your concerns related to adapting to a stairlift in living situations with others. They can demonstrate a variety of mobility aids to suit your needs, while also providing support and service to seamlessly integrate this equipment into your home environment.